Yesterday’s candle confirmed once again how strong the resistance is proving to be at the current level and whilst the closing price finished above all three moving averages it simply reinforced the sideways consolidation of the last few weeks. I can only reiterate my advice of this week which given the Japanese year end and fundamental news due out later today makes trading in this pair a bit of a lottery. The fundamental news which may have some influence is centred on the unemployment claims which are expected to come in at 650k followed shortly after by the release of the GDP figures and I have covered these in more detail on the euro to dollar site. In addition we also have the Geithner effect which was in evidence across the forex market yesterday when Treasury Sec Geithner implied that the US dollar could lose its reserve status in the future. Today he is testifying before the Financial Services Committee on the financial regulation of the markets. This evening sees three important released in Japan, starting with Tokyo Core CPI followed by National Core CPI and finally retail sales all of which are likely to have a significant impact on the dollar yen pair. Tokyo CPI measure the change in the price of goods and services (excluding fresh food) bought by Japanese consumer in Tokyo and the forecast is for a figure 0.4% against a previous 0.6%. 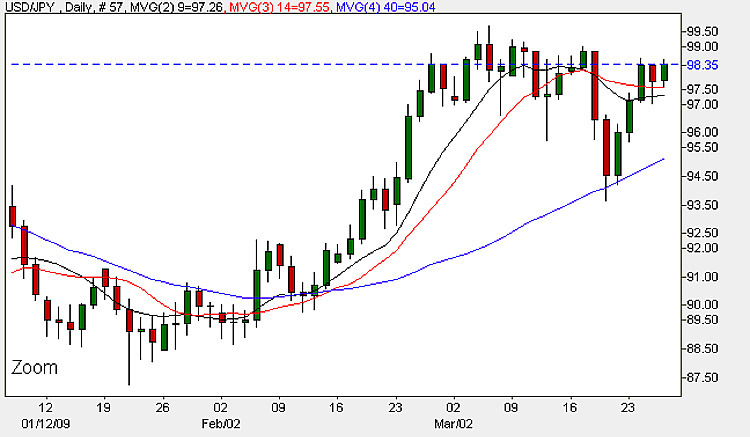 If the actual is better than forecast then this is generally positive for the Japanese Yen. National Core CPI is released at the same time but these figures tend to be overshadowed by the Tokyo data set. The forecast is flat at 0%. The final set of figures is retail sales which is a measure of the change in total sales in the retail market and is a primary measure of consumer spending and sentiment. The forecast is for a further fall to -3.6% against -2.4% indicating a worsening situation. If you feel confident in trading today then you could try small long positions using the hourly charts for suitable entry and exit points as there is a slight bullish tone following yesterday’s candle with a long, lower shadow but be aware of all the issues outlined above. For the latest live currency charts, latest currency news, fundamental news and economic calendar just click on the appropriate links.